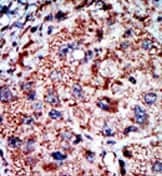 This antibody is specific for Fructose 6 Phosphate Kinase Liver type (isoenzyme B). A KLH conjugated synthetic peptide selected within aa 650~700 of human PFKL (C-Terminal). Our Abpromise guarantee covers the use of ab37583 in the following tested applications. WB 1/100 - 1/500. Detects a band of approximately 85 kDa (predicted molecular weight: 85 kDa). Staining of Fructose 6 Phosphate Kinase on Formalin-fixed and paraffin-embedded human hepatocarcinoma tissue, using ab37583 at a 1/50 dilution (a peroxidase-conjugated the secondary antibody, followed by AEC staining was used). This data demonstrates the use of this antibody for immunohistochemistry; clinical relevance has not been evaluated. Publishing research using ab37583? Please let us know so that we can cite the reference in this datasheet. 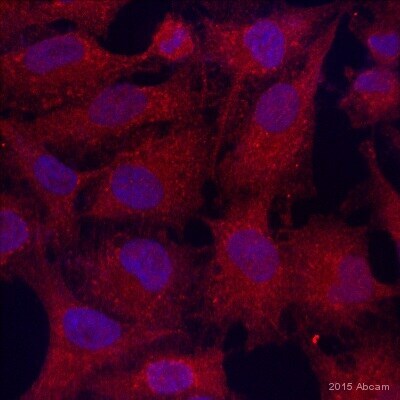 Our lab is interested in buying one antibody which can recognize PFK1 in human fibroblast cell. We will use whole cell lysate sample. I am wondering whether the product you have Anti-PFKL antibody (ab37583), can detect PFK1 in human fibroblast cell lysate in western blot. Thank you for contacting us. This antibody has been tested in WB with human samples and is therefore guaranteed for this application and species. I am not sure if fibroblasts specifically have been tested, but if the protein is expressed in this cell type, the antibody should work and it would be guaranteed. We guarantee all our products for tested species and applications as listed on the datasheet. The guarantee is valid for 6 months after a purchase. For more details about our Abpromise guarantee please check this link: https://www.abcam.com/abpromise. I hope this information is helpful to you. Please do not hesitate to contact us if you need any more advice or information.